Being Frugal and Making It Work: Join the Egg-cellent Team Challenge & Earn Bonus Swagbucks! 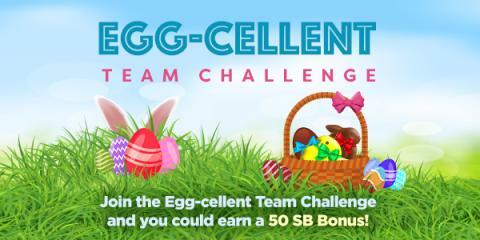 Join the Egg-cellent Team Challenge & Earn Bonus Swagbucks! 1. Join the challenge and be assigned to a team. Pre-registration is going on right now! If you don't already have an account, you can sign up on this page as well. All members who participate and contribute at least 400 points to their team’s total will receive a SB bonus in the form of a SB Swag Up Rebate on their next gift card! Not only that, but if you earn 300 SB before May 1st, you'll get a 300 SB bonus (as long as you've signed up under me)!